I get excited about strange things. My local butcher sells mostly free range meat, and when I asked if they had any pork mince, they told me to pick whichever cut I wanted and they would mince it for me. 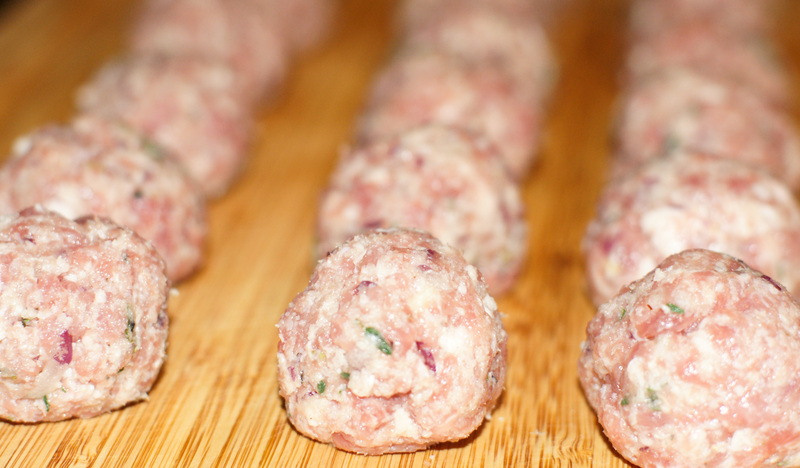 For some reason, the idea of freshly minced free-range scotch fillet pork sounded so good, I couldn’t wait to get home and make up these meatballs. Now I keep thinking of all the things I can make with different types of meat minced. I’ve always thought about buying a mincer, but this is even better. 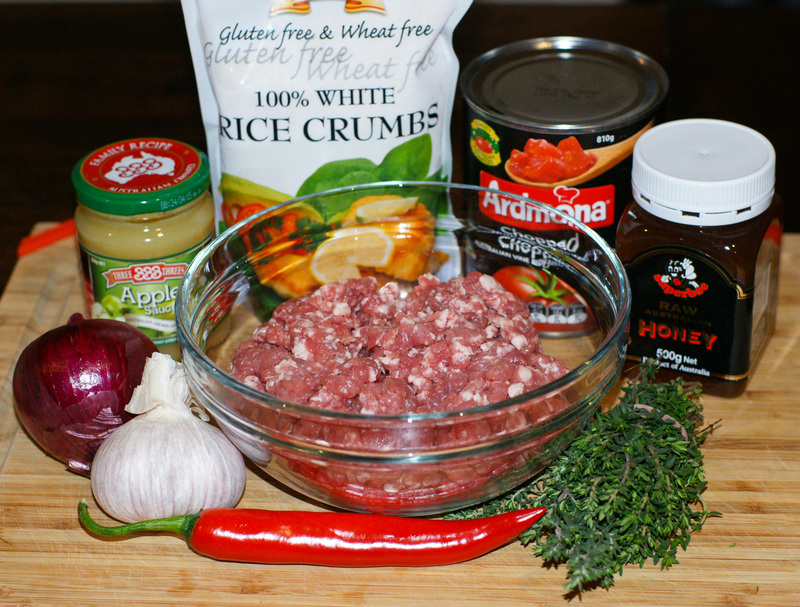 Any meat I want freshly minced, and I don’t have another appliance to clean – happy days! I was worried that adapting this recipe to remove the bread, milk, eggs & cheese would take away from them. But I am very happy to say, that they are moist, light, hold together well and taste absolutely spectacular (the original recipe is from Donna Hay Magazine Ed50). Instead of grated apple, I used apple sauce as a binder, since I have taken out the eggs. I don’t think you can really taste any difference, they are just as good as I remember them to be. 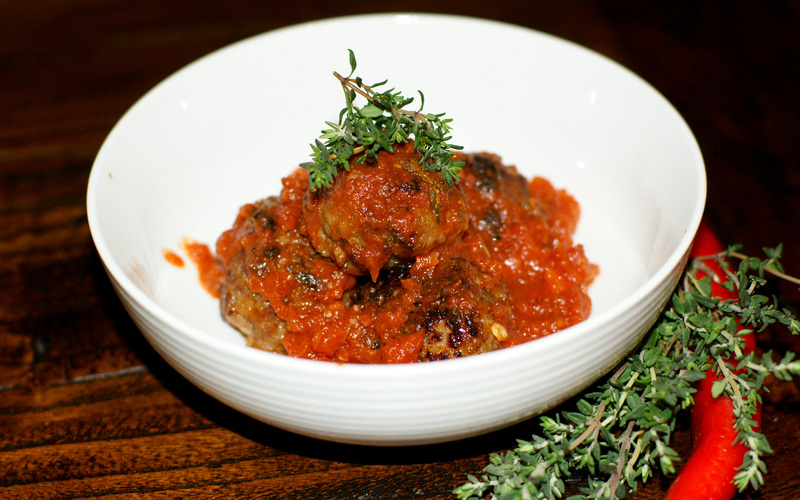 Trust me, these take meatballs to a whole new level. 1) In a small bowl, mix the rice crumbs and rice milk together, and leave to the side. (if you can have gluten & dairy, you can use 1 slice white bread torn up and soaked in 1/4 cup milk instead). 2) In a large mixing bowl, add the pork, apple sauce, grated onion, thyme, honey, garlic, rice crumb mixture, salt & pepper. 3) Roll about 2 tablespoons of the mixture into balls. 4) Heat the oil in a fry pan over a medium heat and cook until browned on all sides. Remove from heat. 5) In a saucepan, add the chopped tomatoes, chilli, garlic, thyme & balsamic vinegar and season to taste with salt & pepper. Simmer over a medium-low heat for 5 mins. Add the meatballs to the sauce and stir through, continue to simmer for another 5-10 mins or until meatballs are cooked through properly. Yum! The kids love meatballs, will have to give them a go. We had the leftovers for lunch today, and Stu sounded devistated when I said they were all gone :). They really are the best meatballs. Let me know what you think of them!